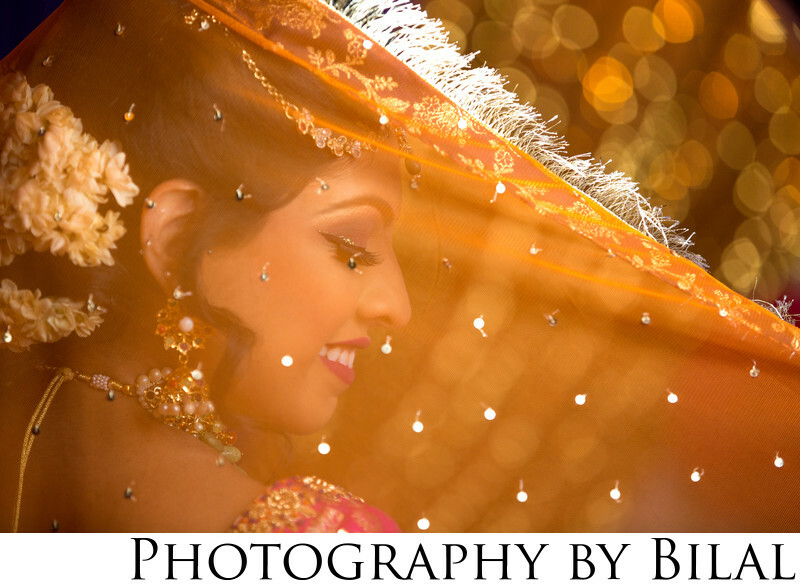 If you searched for the best Pakistani wedding photographers in your area, then chances are you probably ended up on my website. Take a look through my galleries and you will see why. I offer a very unique style of photography, work with only the best and latest gear, including multiple prime lenses, full frame camera bodies, and many different types of lighting which can be used both on and off camera. Being a professional photographer means not only having the technical knowledge of photography but also a creative vision. When technical knowledge is combined with a creative eye that's when stunning images are brought to life. This particular image required a great deal of skill. Due to the lack of contrast the camera was not able to focus on the subject. From experience I knew the only way get my focus tack sharp was to manually focus the lens, which was not an easy task because I was shooting with a 70-200 zoom lens which is a beast of a lens and very heavy. I managed to capture the perfect expression of the bride and the lighting credit was due to my amazing westcott octabox which was placed slightly out of frame. It took a while to manually focus but the end result was totally worth it! Location: 2085 NJ-27, Edison, NJ 08817. Keywords: edison NJ (3), mehndi (3), pakistani wedding (12).